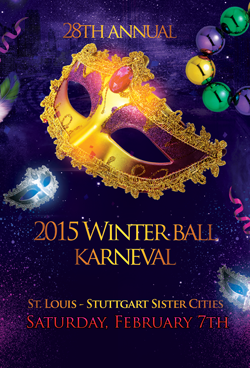 The St. Louis-Stuttgart Sister Cities, Inc. organization (SLSSC) invites St. Louisans to help them celebrate their 55th Anniversary at the upcoming 28th Annual Masquerade Karneval Winter Ball, taking place on Saturday, February 7, 2015 from 5:30 pm to 12:00 midnight at The Hilton St. Louis Frontenac Hotel, located at 1335 South Lindbergh Blvd. in Frontenac, Missouri. As the major fundraiser for the St. Louis-Stuttgart Sister Cities Organization, the annual Winter Ball event brings together guests, members, patrons and corporate sponsors from the surrounding area for a fun-filled evening, in the spirit of the Mardi Gras season. The evening festivities begin with cocktails at 5:30 pm, and will include a sumptuous three course dinner, dance music by Matthias Wagner of Kansas City, plus a raffle and silent auction and other fun surprises. The Mistresses of Ceremonies are SLSSC President Susanne Evens and St. Louis media personality Sherry Farmer of OnStl.com. Dress for the evening is black tie optional, and there will cash prizes for the best Mardi Gras costumes & masks. This annual gathering for the St. Louis-Stuttgart Sister Cities organization is anticipated to draw close to 400 guests, including the 2015 Karneval royalty and Special Guests of Honor S.T. Prinz John Leo I & I.L. Prinzessin Marie I, along with their Royal Entourage and Members of the Kansas City Germania Club and German-American Citizens Association. Or you can purchase tickets by calling Roy Leimberg at 314-481-3184 or via e-mail royleimberg@sbcglobal.net. St. Louis-Stuttgart (Germany) Sister Cities is St. Louis’ oldest Sister City. This not-for-profit organization was started in 1960. Now an international and a civic organization, St. Louis-Stuttgart Sister Cities, Inc. functions as a civic as well as an international organization, keeping a high profile in the St. Louis community by participating in local ceremonies. The St. Louis – Stuttgart Sister Cities Winter Ball raises money for scholarships for students wanting to study over seas. Please help us in meeting our goal this year and join us for this fun, festive event. The funds raised through the Winter Ball Karneval support the organization’s cultural, educational and business/trade events and programming for members and the general public alike. These activities include student exchanges, as well as scholarships and educational grants which enable high school and college students, educators and business interns to study abroad. The annual Winter Ball fundraiser helps foster business, education and cultural exchanges between the cities. Over the years, the SLSSC organization has been made up of German natives, business executives, former students, Americans who have visited Germany for the love of German culture. Alex Araiza, Harrison Billy, Bob Case, Norm Cleeland, Barbara Dressel, Susanne Evens, Kim Henson, Dorris Keeven-Franke, Linda Kurz, Roy Leimberg, Lindsay Pickens, Robert Roeder, Helga Thalheimer, Mary Kathryn Victor, Ilona Wilken, Judith Weilepp and Traude Wilson.